Built in the 12th and 13th centuries, Notre-Dame is the most famous of the Gothic cathedrals of the Middle Ages. Gasps and cries of “Oh my god” erupted at 7:50pm (1750 GMT) when the top portion of the church’s spire came crashing down into an inferno that has spread to the entire roof. Police were attempting to clear pedestrians away from the two islands in the river Seine, including the Ile de la Cite which houses the soaring Gothic church, one of Europe’s best known landmarks. Another woman passed by, tears streaming from behind her glasses, too overwhelmed to speak to reporters. Built in the 12th and 13th centuries, Notre-Dame is the most famous of the Gothic cathedrals of the Middle Ages as well as one of the most beloved structures in the world. Situated on the Ile de la Cite, an island in the Seine river, the cathedral’s architecture is famous for, among other things, its many gargoyles and its iconic flying buttresses. Its priceless treasures also include a Catholic relic, the crown of thorns, which is only occasionally displayed, including on Fridays during Lent. The cathedral was immortalized in Victor Hugo’s “The Hunchback of Notre-Dame”, published in 1831, and has long been a subject of fascination in popular culture as well as the traditional art world. 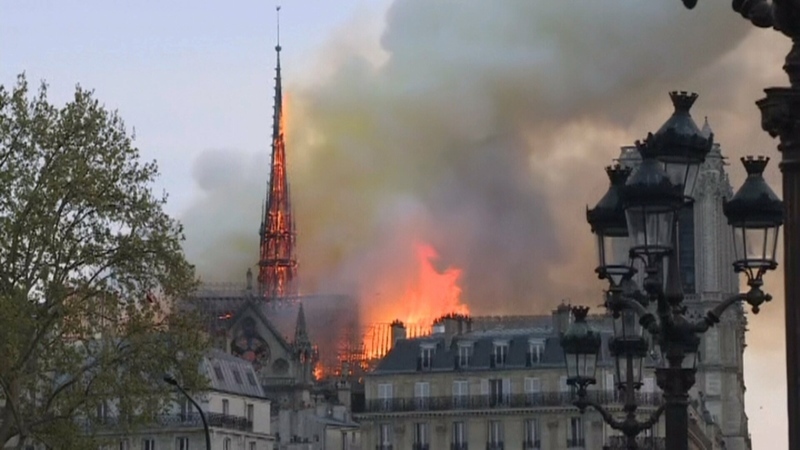 “Everything is burning, nothing will remain from the frame,” Notre-Dame spokesperson Andre Finot told French media. French historian Camille Pascal told BFM broadcast channel the blaze marked “the destruction of invaluable heritage”. “It’s incredible, our history is going up in smoke,” said Benoit, 42, who arrived on the scene by bike. Sam Ogden, 50, had arrived from London on Monday with her husband, their two teenaged sons, and her mother. They had come to Paris specifically to see Notre-Dame, part of a world tour over years to see historic sites. “This is really sad — the saddest thing I’ve ever stood and watched in my life,” Ogden said.